Yes, that Billingsley. This was the steakhouse founded by the son of Barbara Billingsley (RIP), Leave It To Beaver's June Cleaver. She was funnier in Airplane. (at the 1:10 mark). 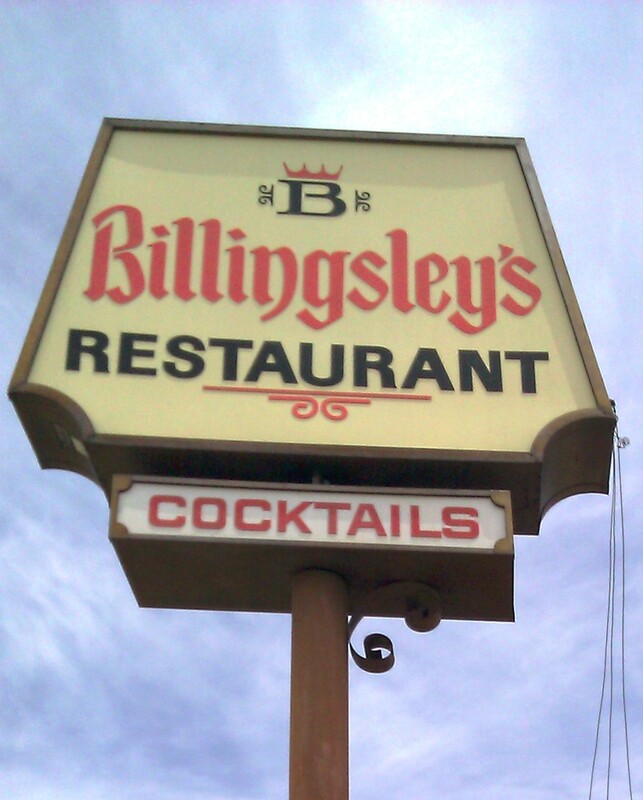 I had been driving by Billingsley's for months, and I had been meaning to drop in for a burger. I am a sucker for a straight-forward, steakhouse burger, and Billingsley's had that no-frills feel to it from the outside. Fat Bruce Lee and I arrived on a Friday at lunch time. Parking was free in the attached lot. The interior was all 60s/70s steakhouse. Burgundy booths and dim lighting. We ordered a couple of the standard burgers with cheese at $8.45 apiece. We waited for about 10 minutes for our food to be delivered by a very friendly waitress--I love it when they call me "honey"--I really do. The Beef: Yes! At Billingsley's the beef was dry-aged sirloin, and it was ground in-house. The bite was rich with beef and mineral flavors. The blend was in the 80:20 range, and it was very juicy without being too greasy. The grind was a little too fine, and this took away from the firmness that one would expect from a Sirloin burger. Additionally, the fine grind caused the beef to yield quite a bit of excess juice, which saturated the bottom bun. The patty was 8 ounces of thick, hand-formed goodness. The funk from the aging was mild and lent a nice nose to the dish without detracting from the beefiness of the bite. The Seasoning: The exterior of the patty was dusted with a fine salt blend. The seasoning was applied in just the right quantity and very evenly. 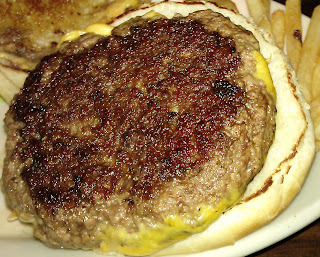 The Sear: Our server informed us that the burgers were cooked on a grill, but the evenness and depth of the sear led me to assume that a griddle was used in the cooking process. I did a little more digging later in the day to confirm my suspicions. Much like The Burger Kitchen, Billingsley's first grilled the burger patties, and then they were finished on the flat top. All that said, the sear was perfect. It was crisp, dark, flavorful, and even. The Preparation: After grinding, the burger meat was handled properly. The beef was formed firmly into thick patties, and it was not over-manipulated. This created the tender yet firm mouth feel. Again, a less fine grind would have yielded a firmer, steakier, less wet burger, but it was excellent, nonetheless. As expected, a 50 year old steakhouse cooked the burgers to a perfect Med-Rare. The Cheese: The American cheese was nicely melted over the burger thanks to a quick trip under the broiler. The American cheese made its way into the bite and lent a salty creaminess that really rounded out the savory flavor profile. 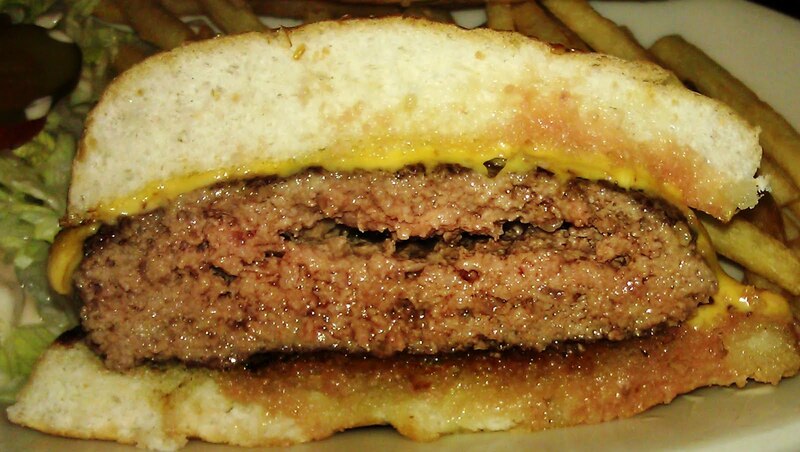 The Bun: The double-toasted, mild, seeded, standard hamburger buns were sourced from Frisco Bakery. The bun was really not up to the task of handling a very juicy 1/2 pound patty of Med-Rare ground beef. The bottom bun was quickly saturated, and it become gooey. A Breadbar bun would have truly done this burger justice. 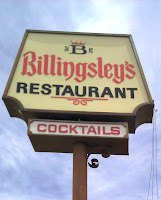 Billingsley's also served burgers on French rolls, and I imagined that those rolls handled the juices more competently. We will put that hypothesis to the test on a return visit. The Meat To Bun Ratio: The meat won the battle, but not by much. We escaped with clean hands. The Fries: The fries were of the frozen, pre-cut, shoestring variety. But.............they were darn good once cooked. The fries were golden, crisp, flavorful, and perfectly seasoned. 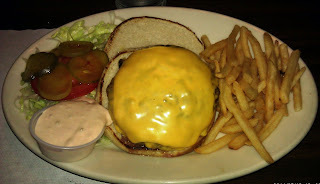 The Toppings: The slice of tomato that accompanied my burger was wonderfully ripe and flavorful. The iceberg was shredded, so that would have created some unwelcome additional moisture had I applied it to my burger....I did not. The Value: Heck yeah! Billingsley's charged us $8.45 for a 1/2 pound patty of perfectly cooked, ground Sirloin and a side of tasty fries. The value was good at Billingsley's. After trying the burgers at Billingsley's it was not surprising that they had been around for over 50 years. Burger Review : A really good, straight-forward, cleanly executed, steakhouse cheeseburger and a really good value were enjoyed at Billingsley's. Here's a link to the Top 10 Burgers in LA for the nice waitress who called me Honey.